As President Lyndon Johnson signed a landmark immigration reform bill into law at a ceremony beneath the Statue of Liberty on October 3, 1965, he predicted the legislation would not significantly affect the life of the nation, but also declared it would accomplish an important national goal. "This bill that we will sign today is not a revolutionary bill," the president said. "It does not affect the lives of millions. It will not reshape the structure of our daily lives. ... Yet it is still one of the most important acts of this Congress and of this administration. For it does repair a very deep and painful flaw in the fabric of American justice. It corrects a cruel and enduring wrong in the conduct of the American nation." The wrong that Johnson and Congress sought to correct was codified in legislation passed 41 years earlier, during a post-war era fraught with anxiety about mass immigration, the shadow of European radicalism, and theories of racial superiority. The 1924 law established a quota system based on national origins. It directed nearly 70 percent of the immigration slots to northern Europeans, cutting back drastically on immigration from southern and eastern Europe. It maintained formidable barriers against immigration from Asia and Africa, while leaving immigration from the Western Hemisphere unrestricted — a gesture of hemispheric solidarity that also served the cheap-labor interests of American employers. 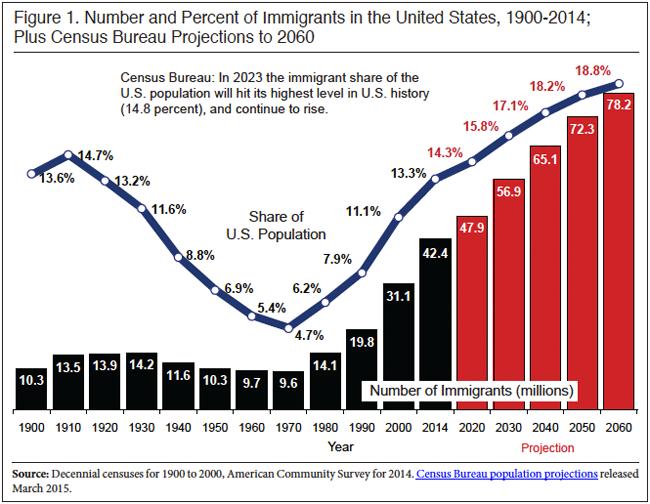 By 1980, most immigrants were coming from Latin America, Asia, and Africa — in numbers far greater than the annual average of 300,000 that had prevailed during the 1960s. Despite assurances by Hart-Celler advocates that the bill would add little to the immigrant stream, more than seven million newcomers entered the country legally during the 1980s. That trend has continued. Meanwhile, illegal immigration also began a decades-long surge. The growth of immigration from Mexico was especially dramatic, for reasons of geography and labor markets as well as demography. By 1960, according to Douglas Massey and Karen Pren, "a massive circular flow of Mexican migrants had become deeply embedded in employer practices and migrant expectations"4 and was sustained by immigrant networks. Those networks exploded along with Mexico's population, which grew from 35 million in 1960 to 100 million at the end of the millennium. Fifty years after the Hart-Celler signing ceremony on Liberty Island, the United States welcomes about a million immigrants each year. They travel along networks energized by the American Dream, swollen by the doubling of the world's population, and enabled by the Hart-Celler Act. That yearning — for acceptance and recognition in American society — was manifest in the struggle of ethnic and religious organizations that waged a decades-long fight to abolish the quota system that they perceived as an ongoing insult to millions of Americans and the lands from which they had come. Passage of the 1965 act was therefore a deeply satisfying symbolic gesture. While the consequences of the 1965 act are clear, the story of how it came to be is less well known. As this paper will show, it was shaped by the combination of political circumstances and the ideology and ambition of key figures. Here we will examine the stories of five of them: Presidents John F. Kennedy and Lyndon Johnson, Reps. Emanuel Celler of New York and Michael Feighan of Ohio, and Sen. Edward Kennedy of Massachusetts. Fifty-two years after President John F. Kennedy was assassinated in Dallas, his name is linked to immigration primarily because of his still-popular book, A Nation of Immigrants. First published in 1958 as Kennedy was a senator preparing to run for the presidency, the book had two central themes: a celebration of immigrants' contributions to the nation and a call to abolish the system by which they had been selected since 1924. Renewal of the system was particularly offensive to groups that represented Italians and Jews, who had been particularly affected by the restrictions. The American Committee on Italian Migration conducted an intensive lobbying campaign. Publication of A Nation of Immigrants was a project of the Anti-Defamation league of B'nai B'rith, which had been impressed by Sen. John F. Kennedy's record of supporting liberal immigration laws, including measures to accept refugees from war-ravaged Europe. While Kennedy was one of his era's most outspoken reform advocates, he used a 1957 speech to the American Jewish Congress to make clear that he did not favor unlimited immigration. He stated his conviction that "we should have a system of limited and selective migration to the United States." Kennedy's ambition to appeal to the ethnic vote, however, faced resistance from fellow Democrats whose principal concern was the Cold War confrontation with the Soviet Union. They saw immigration policy as a potential entry point for Communist subversives. In this super-heated environment, Kennedy's approach was a mixture of liberal idealism and political pragmatism. And so, after becoming president in 1961, he moved cautiously lest he antagonize Walter, with whom he had a good relationship. The New York Times described the Pennsylvanian as "one of President Kennedy's most valued lieutenants in the House." In short order, twin bills that embodied the president's program were introduced. The Senate version was sponsored by Philip Hart (D-Mich.), while the House bill was sponsored by Emanuel Celler (D-N.Y.). By this time, however, the administration was occupied with other priorities, particularly in foreign policy. Moreover, it quickly became apparent that Walter's replacement at the head of the Judiciary Committee was not eager to move on immigration. When President Lyndon Johnson signed the Hart-Celler Act into law in October 1965, he was at the height of his powers. A year earlier, after his landslide election victory over Barry Goldwater, he was in a euphoric mood as he proclaimed, "These are the most hopeful times since Christ was born in Bethlehem. "18 Richard Goodwin, a White House speechwriter, had coined the phrase the "the Great Society" to signal the extent of Johnson's ambition to establish a broad range of government services and programs. Goodwin later wrote that liberals during this period had the expansive sense that the world was "malleable to their grasp". Beginning the new term with an overwhelmingly Democratic Congress, Johnson presided over a series of legislative victories, including the Civil Rights Act, the Voting Rights act, the establishment of Medicare and Medicaid, and programs to implement his "war on poverty". He made immigration a priority for 1965. Johnson biographer Robert Dallek said the tragic circumstances that had put Johnson in the White House also made many Americans eager to support his redemptive vision of national greatness. President Kennedy, preoccupied with foreign policy, had not mentioned immigration in any of his three State of the Union addresses. But as Johnson delivered his first such address less than two months after becoming president he became an energetic advocate of the reform. "We must ... lift by legislation the bars of discrimination against those who seek entry into our country, particularly those who have much needed skills and those joining their families," President Johnson said. In a reference to the legislation's use of preferences to replace national quotas, he added: "A nation that was built by the immigrants of all lands can ask those who now seek admission: 'What can you do for our country?' But we should not be asking: 'In what country were you born?'" Famous for his forceful talents of personal persuasion, Johnson summoned congressional leaders to a White House meeting that included representatives of religious, ethnic, and labor organizations. He learned that House Judiciary Committee Chairman Emanuel Celler was encountering resistance from Michael Feighan, the conservative Ohio Democrat who replaced Francis Walter as chair of the immigration subcommittee. Johnson responded with characteristic forcefulness. The New York Times reported that Johnson "put Mr. Feighan on his fabled list for 'the treatment.' That meant White House dinners, consultations in the Oval Office and trips on Air Force One." Johnson's success with the immigration bill was one of his last domestic victories. His popularity would be fleeting. The war in Vietnam deeply divided the country and Johnson decided not to seek reelection in 1968. There were hints of the trouble ahead even in that fall of 1965 as he signed the immigration bill. The same October 4, 1965, New York Times front page that reported on the signing ceremony on Liberty Island included other stories that foreshadowed the trouble ahead. One reported a warning from Chinese President Chou En-lai about the dangers of expanding the war in Vietnam. But Johnson persisted. He expanded the war, and his popularity withered. The war would have major implications for immigration. Hundreds of thousands of Southeast Asians would flee the violence as refugees and many would find homes in the United States. In publishing the story about the signing of Hart-Celler, the Times, made an editorial decision that suggested the issue of Cuban refugees was more momentous and controversial than the sweeping immigration reform, which had passed with overwhelming majorities in both the House and Senate. Its headline read: "U.S. to Admit Cubans Castro Frees; Johnson Signs New Immigration Bill". No one gave voice to that resentment more forcefully than Emanuel Celler. He became a member of the House of Representatives in 1923 and fought the Johnson-Reed Act from the start. Celler kept fighting for 41 years until he was able to attach his name to legislation that erased the national-origins system. During World War II, Celler appealed in vain for President Franklin Roosevelt to rescue Jewish refugees fleeing the Nazis. In the Cold War era of the 1950s, he opposed the McCarran-Walter Act, whose advocates said it was needed to protect the country from subversives from abroad. When President Johnson picked up the legislation written by President Kennedy's Justice Department, Celler immediately signed on. But progress stalled as Celler engaged in what became a notorious Capitol Hill feud with the chairman of the Judiciary Committee's immigration subcommittee, an ardent anti-communist and immigration skeptic from Ohio named Michael Feighan. Those who sought to limit immigration warned that unless Congress acted, the United States could be overwhelmed by desperate people ignoring borders and clamoring for visas. The reform advocates responded with a disciplined messaging strategy. Uniting in the insistence that their proposal would allow only minimal growth of immigration, they played up the symbolic importance of erasing the old system. In early 1965 Ohio Democrat Michael Feighan, chairman of the House immigration subcommittee, delivered what he would call his "bombshell"32 speech to the 36th annual conference of the American Coalition of Patriotic Societies, a conservative group that supported the national origins quota system of immigration law. Feighan, who had used his position at the immigration subcommittee to stall the Johnson administration's push for reform, proposed an alternative plan. He would go along with abolition of the national origins system. But as part of the deal he wanted a new system whose first priority would be family unification, not boosting the nation's supply of skilled workers. In a single stroke, Feighan sought to cast off the obstructionist label he had acquired in 1964 when he stalled hearings on the administration bill because of his feud with Celler over Feighan's request to fund a joint House-Senate subcommittee investigation into the federal government's management of immigration policy. A year earlier, columnist Drew Pearson mockingly wrote that Feighan "has been seeing communist plots around almost every corner. "38 Pearson openly favored Feighan's opponent in the 1964 Democratic primary, a young Cleveland attorney who had made Feighan's immigration politics a major part of his campaign. Feighan's plan was a master stroke of local politics. It not only endeared him to labor unions that did not want a soft labor market for employers of skilled workers, but also won the gratitude of ethnic organizations that represented his district's large population of voters with relatives in eastern Europe. The archives of Feighan's documents at Princeton, his alma mater, show the importance of the ethnic groups to his narrow 1964 primary win. A letter from the Committee of Serbian Organizations of Cuyahoga County announced their unanimous endorsement of Feighan.41 Another document shows endorsements from Organized Labor, the Hungarian Democratic League, the Slovak League of America, the United Ukrainian Societies of Cleveland, the Croatian Societies of Cleveland, American Friends of Anti Bolshevik Bloc of Nations, and the Byelorussian Association of Cleveland. Feighan's plan even had fans on the other side of the debate. Conservative and patriotic groups like the American Legion expressed satisfaction with his assurance that it would maintain the old, familiar pattern of immigration that had been eroded in recent years. In addition to reversing the preference priorities, Feighan also sought to reduce immigration by setting an absolute annual limit on the number of immigrants welcomed to the country. That effort would fail, but concerns about population growth would live on. In a speech delivered at the City Club of Cleveland in the spring of 1965, Feighan cited a column by influential national political commentator Eric Sevareid who spoke of "fast-running population growth" as a national problem and expressed concern about the 300,000 immigrants the United States was taking every year. But there was remarkably little discussion of the population issue as Hart-Celler moved through Congress. The bill's conservative foes raised the issue. Its liberal supporters were successful in dismissing it. There were multiple reasons for the success in overturning an immigration system that had been locked in place since 1924. Perhaps the most important was the landslide election of 1964, after which the Democrats held 68 seats in the Senate and 248 seats in the House. The switch of Rep. Michael Feighan from resistance to cooperation was key in the House. In the Senate, much of credit went to the political and personal skill of the 33-year-old Kennedy, who had been elected just three years earlier to the seat once held by his brother John. 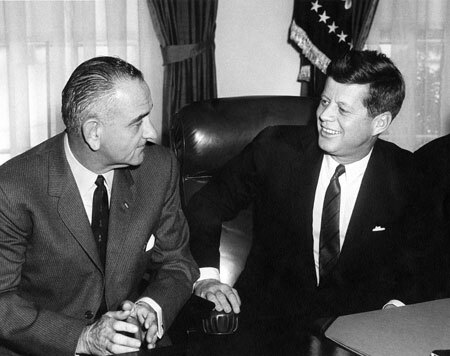 One of the elements of Kennedy's success was his good working relationship with the chairman of the House Judiciary Committee, Mississippi Democrat James Eastland. Eastland, a notorious segregationist, had long fought to uphold the system put in place in 1924. But in the summer of 1965, the New York Times reported Eastland had said "that he would do nothing to block the administration's measure, and turned over public hearings of the bill to one of its strongest advocates, Edward M. Kennedy. "47 Eastland's remarkable gesture may have been an effort to support his old friend, President Johnson. But of course the United States in the mid-1960s was undergoing dramatic social change where liberal values were ascendant, particularly regarding race relations and minority rights. Edward Kennedy's ability to develop friendships with those who resisted the change, particularly powerful southern Democrats, enabled him to defuse tensions like those that developed between Ervin and Kennedy's brother, Robert Kennedy, who had been elected to the Senate from New York in 1964. The intensity of Robert Kennedy's dislike of the national-origins system brought advantages and disadvantages to the reform effort. On the one hand, he was an eloquent spokesman for the proposition that the old system was unjust. On the other, he was temperamentally incapable of concealing his frustration with Ervin's views. In his effort to ease the anxiety of conservatives, Edward Kennedy met with representatives of the American Coalition of Patriotic Societies, the American Legion, the Daughters of the American Revolution, and the National Association of Evangelicals. There he appears to have benefitted from Rep. Feighan's research showing that Congress so frequently passed legislation to circumvent the quotas that the national origins system had become dysfunctional. Such assurances reflected political necessity rather than careful analysis. Steven Gillon reported that "neither Congress nor the White House had carefully analyzed the potential impact of the family preference system." And so, swept along by an historic tide of liberal convictions, the Hart-Celler Act won overwhelming approval in both Houses of Congress. The nobility of the legislation lay in its defense of the American creed that all me are created equal. Its success in Congress was a demonstration of how much the nation had changed from the days when conservatives smeared immigration-reforming liberals as communist dupes and "gulliberals" and when frankly segregationist views were commonplace. Now it is those who express the conservative conviction that immigration should be limited who receive the harshest attacks. Immigration advocacy groups and political operatives often label them as racists, nativists, bigots, and reactionaries. Then, perhaps with an idea about the sort of political pressures reflected in the 1968 New York Times article on congressmen who didn't want to appear to be racist, Jencks added a gloomy assessment of the possibilities that leaders would direct a change. "Once I posed the problem this way," he wrote, "my statistical projections no longer seemed so fanciful." Jencks had quantified concerns that led Theodore White to lament the consequences of Hart-Celler. "Only one other great republic has ever experienced such a change in the texture of its people — the Roman Republic," White wrote. He then observed that "Rome could not pass on the heritage of its past to the people of its future" and ultimately unraveled so badly that it "could no longer govern itself". White's pessimism about the potential consequences of mass immigration remains a central concern of those who seek to limit immigration. But, of course, there are powerful voices on the other side of the debate. In a new book released in time for Hart-Celler's 50th anniversary, journalist Tom Gjelten quotes Walter Lippman's observation in 1913 — an era of intense immigration that eventually led to the backlash that produced the 1924 Johnson-Reed Act — that while immigration "may swamp us, it may, if we seize the opportunity, mean the impregnation of our national life with a new brilliancy." 1 John Higham, "Cultural Responses to Immigration", Democracy and its DiscontentsNeil J. Smelser and Jeffrey C. Alexander, eds. Princeton: Princeton University Press, p. 50. 2 David S. FitzGerald and David Cook-Martín, Culling the Masses: The Democratic Origins of Racist Immigration Policy in the Americas, Cambridge: Harvard University Press, 2014, p. 121. 3 James Fallows, "Immigration: How it's affecting us", The Atlantic, November 1983. 4 Douglas S. Massey and Karen A. Pren, "Unintended Consequences of US Immigration Policy: Explaining the Post-1965 Surge from Latin America", Population and Development Review, Vol. 38, No. 1 (March 2012), pp. 1-29. 5 Jennifer Ludden, "1965 Immigration Law Changed Face of America", National Public Radio, May 9, 2006. 6 John Higham, Strangers in the Land: Patterns of American Nativism 1860-1925, New Brunswick, N.J.: Rutgers University Press, 1969, title of Chapter Ten. 7 Kennedy quoted Ronald Takaki, A Different Mirror, New York: Little, Brown, 2008, p. 262, Note 17. 8 John Higham, "Cultural Responses to Immigration", Democracy and its Discontents, Neil J. Smelser and Jeffrey C. Alexander, eds. Princeton: Princeton University Press, p. 52. 9 Harry S. Truman, "182. Veto of Bill To Revise the Laws Relating to Immigration, Naturalization, and Nationality veto statement", June 25, 1952. 10 Stephen Thomas Wagner, "The Lingering Death of the National Origins Quota System: A Political History of United States Immigration Policy 1952-1965", doctoral dissertation, Harvard University, 1986, p.344. 11 Kennedy speech to the American Jewish Congress, quoted at p. 68 of Betty K. Koed, "The Politics of Reform: Policymakers and the Immigration Act of 1965", doctoral dissertation, University of California at Santa Barbara, 1999. 12 Kennedy letter to Johnson, June 29, 1955, Senate Files, Presidential Papers, Kennedy Library, quoted by Wagner, p. 315. 13 "The War Against Our Immigration Law," Human Events, April 20, 1957; see also: Wagner dissertation, p. 322. 14 Interview with Norbert A. Schlei. 15 "Rep. Francis Walter, 69, Dies; Wrote Immigration Restrictions", The New York Times, June 1, 1963. 16 Text of Kennedy letter, "Presidential Papers Historical Series: Letter On Revision Of The Immigration Laws". 17 Abba P. Schwartz, The Open Society, New York: William Morrow & Co., 1968, p. 116. 19 Robert Dallek, Flawed Giant: Lyndon Johnson and His Times, 1961-1973, Oxford: Oxford University Press, 1998, p 236. 20 Robert B. Semple, Jr., "U.S. to Admit Cubans Castro Frees; Johnson Signs New Immigration Bill", The New York Times, October 4, 1965. 21 John Higham, Strangers in the Land: Patterns of American Nativism 1860-1925, New Brunswick, N.J.: Rutgers University Press, 1969, p. 318. 23 "Nordic Victory Seen in Drastic Reduction", Los Angeles Times, April 13, 1924..
24 Spartacus Educational, "Emanuel Celler". 25 Emanuel Celler, You'll Never Leave Brooklyn: The Autobiography of Emanuel Celler, New York: The John Day Company, 1953, p. 6. 26 The Dan Smoot Report, February 11, 1957. 27 "Immigration Impasse," The New York Times, June 18, 1965. 28 "The Population Explosion", editorial, The New York Times, May 15, 1961. 30 Hearings of the House Committee on the Judiciary, Subcommittee No. 1, June 11, 18, 19, 22, 23, 25, 26, 29, 30, 1964, p. 6. 31 Congressional Record, August 25, 1965, p. 21812. 32 William Samuel Stern, "H.R. 2580, The Immigration and Nationality Amendments of 1965 — A Case Study", dissertation in Political Science, New York University, 1975. 33 Steven M. Gillon, That's Not What We Meant to Do: Reform and Its Unintended Consquences in Twentieth-Century America, New York: W.W. Norton & Co., 2000, p. 171. 35 Aristide R. Zolberg, A Nation by Design: Immigration Policy in the Fashioning of America, Cambridge: Harvard University Press, 2006, p. 333. 36 "Feighan-Celler Feud", Congressional Quarterly Almanac, 1965. p. 463. 37 "Immigration Reformer Michael Aloysius Feighan", The New York Times, August 25, 1965. 38 Pearson column, found in The Daily Reporter, Dover Ohio, April 4, 1964. 39 The Cleveland Plain Dealer noted Johnson's remark in an editorial of March 20, 1966, "Nominate Mike Sweeney in 20th". 40 Abba P. Schwartz, The Open Society, New York: William Morrow & Co., 1968, p. 116. 41 Feighan archives at Princeton, Box 28, Folder labeled "Serbia" has letter dated April 25, 1964, from the Committee of Serbian Organizations. 42 Feighan Archives at Princeton, Box 38, article from Fra Noi, April 1964, p. 15. 43 Deane and David Heller, "Our New Immigration Law", American Legion Magazine, February 1966. 44 Feighan speech to City Club, material in Feighan archives, Box 38, Folder labeled "Cleveland hearings on 2850". 45 The Washington Post, Oct. 4, 1965. 46 Wall Street Journal, October 4, 1965, discussed at p. 339 of Taylor Branch, At Canaan's Edge: America in the King Years 1965-1968, New York: Simon & Schuster, 2006. 47 "Immigration Bill Nears House Vote", The New York Times, August 1, 1965. 48 Otis L. Graham Jr., Unguarded Gates: A History of America's Immigration Crisis, Lanham, Md. : Rowman & Littlefield, 2004, p. 90. Senate Subcommittee on Immigration and Naturalization of the Committee on the Judiciary, Immigrtion Hearings, 89th Congress, First Sessioin, Washington, p. 67. 49 Burton Hersh, Edward Kennedy: An Intimate Biography, Berkeley, Calif.: Counterpoint, 2010, p. 196. 50 "Edward M Kennedy, "The Immigration Act of 1965", Annals of the American Academy of Political and Social Science, Vol. 367, The New Immigration (September 1966), pp. 137-149. 51 U.S. Senate, Subcommittee on Immigration and Naturalization of the Committee on the Judiciary, Washington, D.C., February 10, 1965, pp. 681-687. 52 Steven M. Gillon, That's Not What We Meant to Do: Reform and Its Unintended Consquences in Twentieth-Century America, New York: W.W. Norton & Co., 2000, p. 168. 53 Senate Subcommittee on Immigration and Naturalization of the Committee on the Judiciary, Washington, D.C., February 10, 1965, pp. 1-3. 54 Congressional Record, September 22, 1965, p. 24784. 55 Theodore H. White, America in Search of Itself: The Making of the President 1956-1980, Harper & Row, 1982, p. 363. 56 Roger Daniels, Coming to America: A History of Immigration and Ethnicity in American Life, New York: Harper Perennial, 2002, p. 368. 57 The New York Times, March 18, 1968. 58 Carolyn Wong, Lobbying for Inclusion: Rights Politics and the Making of Immigration Policy, Redwood City, Calif.: Stanford University Press, 2006, p. 45. 59 A Nation by Design, p. 9. 60 Nathan Glazer, "The Closing Door", The New Republic, December 26, 1993. 61 Christopher Jencks, "Who Should Get In?" The New York Review of Books, November 29, 2001. 62 Tom Gjelten, A Nation of Nations: A Great American Immigration Story, New York: Simon & Schuster, 2015, p. 343.